I spent the weekend bent over this sad-looking ladder. I sanded it until I turned into a sawdust pile. Then Jeremy and his dad helped fix the broken leg and kindly built me three ‘drawers’. I stained and varnished it and the end result was everything I hoped for – perfect for the CY Market that is on from Wednesday to Sunday this week. 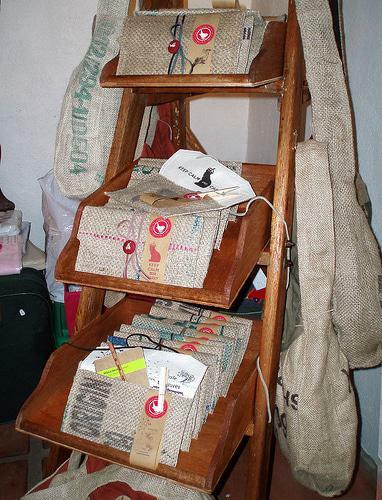 This is the perfect display for my Coffee Clutches. The drawers ‘hold’ each design and the new labeling indicates the design and colour inside. On the sides are hooks to hang some Organic Coffee Bags (if I need to). 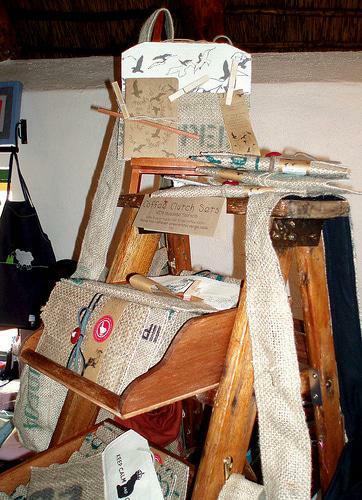 On the top I placed a small easel for displaying the fourth coffee clutch design (Soaring Seagulls). 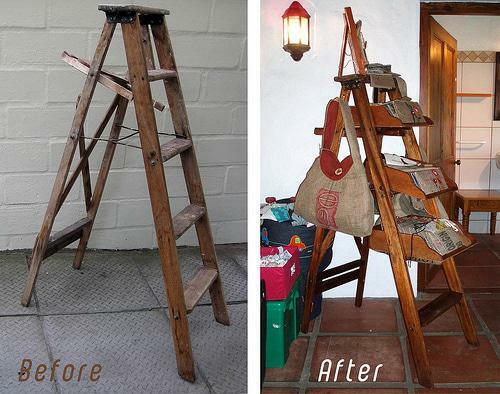 This entry was posted in DIY Projects and tagged coffee clutch, display, DIY, ladder, ladder drawers, make over. That’s is so cool! This makes you look at random items in a completely new light. Maybe you could direct me into a direction where I could possibly find some place or help to refurbish an old kitchen scale. Wow…thatÂ´s so great!I love it!Great work and idea,Wendren! such a great idea!!! i have a few old furniture pieces that have been passed down that have been waiting for new looks- if only i can get motivated!! now i just wish i had an old wooden ladder!! Gosh, this is so brilliant!!! That is a very cool way to display your stock but also a clever way to reuse an object. i hate it when people just throw stuff away without giving it a second chance. good for you! You have such clever creative ideas. hi, loved the ladder. Visited the CY market this evening and could not resist buying a strawberry bird pouch. Saw them on etsy before, but never got round to buying one! Now I’m a proud owner! Your bags are also stunning…where will these be sold again soon? This looks great! Such a good idea. Looove this! Now to get my hands on a wooden ladder!